Controlling the reigns of the Missouri Tigers offense, Phil "Flip" Pressey guided the nation's most efficient offense to a 30-4 record before their disappointing loss to Norfolk State in the first round of the NCAA tournament. With new coach Frank Haith, Missouri operated at a much slower pace, and this style of play suited a pure point guard in the mold of Phil Pressey better than the frenetic tempo played by Mike Anderson's squads in previous years. Pressey was particularly dangerous as a passer when he got into the lane, showing very good vision and creativity in hitting the big man diving to the basket and constant awareness of where the three point shooters were stationed as outlet valves. He was able to get into the lane with regularity thanks to his excellent combination of quickness and ball-handling ability, as he has a very low and tight dribble, always having complete control over the ball. He has a very good crossover, and overall has a tremendous amount of misdirection moves when he can't get by his defender with pure quickness alone. Missouri also put Pressey in plenty of pick and roll situations. His combination of quickness, ball-handling, and ability to shoot off the dribble presented a tough cover in these sets, and he once again was able to use this to get into the lane and create scoring opportunities for his teammates. He was also able to use these sets to create offense for himself, as he showed excellent ability to shoot off the dribble, needing very little space and time to get off a jump shot with his short, compact release. Pressey has a very good, repeatable form and good touch on his jump shots, and this is overall his biggest weapon when generating his own offense. He still isn't terribly consistent in this area, though, only converting 36.5% of his 3-pointers last season, and 34% of his overall jumpers. Part of this has to do with his shot-selection, which can be questionable on occasion, and part of this might have to do with his lack of size. NBA scouts will surely want to see him become more consistent in this area. When Pressey gets into the lane and is forced to score on his own, some of his deficiencies show up. He has very good touch and body control, but his lack of size and strength prevent him from finishing at the rim at the rim at a high rate, and he struggles to finish through contact. He converted just 47% of his attempts around the basket last year according to Synergy Sports Technology, which is a below average rate, and doesn't draw a great deal of fouls. He also tends to get slightly out of control at times, frequently leaving his feet without having an outlet to pass to, which results in some turnovers or forced shots and passes that have little probability of success. Further developing his floater and short pull-up game could help him avoid these situations and present him new opportunities to score. 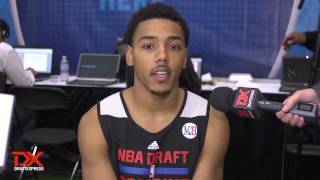 Measuring in at just 6-0, and 178 pounds, with a 6-3 wingspan, Pressey's size and strength presents some obvious problems on the defensive side of the ball when trying to project him to the NBA. He moves his feet fairly well laterally, but his lack of length makes it hard for him to adequately contest shots, and his lack of strength makes it hard for him to fight through screens. He also has a tendency to gamble a bit too much. This results in a very impressive 2.6 steals per 40 minutes pace adjusted, but it also has a tendency to put his teammates in a tough rotation to cover up for him when the gamble does not pay off. With the graduation of Marcus Denmon, Ricardo Ratliffe, and Kim English, Phil Pressey and the Missouri Tigers are going to have a lot of offensive talent to replace, and Pressey will have lost some of his favorite targets. How Pressey continues to find the right balance between passing and scoring will be interesting to watch. If Pressey can prove he can score efficiently from inside and outside the arc, his combination of shooting, court vision and feel for the game should make him a coveted option considering the demand in today's NBA for pure point guards who can create for themselves and others.